The province accounts for over 60% of Argentina's wine production. Among the most important characteristics, it boasts a great diversity of soils, climate, and altitude, producing young and fruity wines, as well as those with great aging potential. Mendoza is considered Argentina’s most important province in terms of productivity, with 165,000 hectares of cultivated vineyards, representing around 66% of the overall wine production in the country. In Mendoza, five valleys stand out. Among them, the upper area of Mendoza River where Malbec is the grape variety that has adapted to this microclimate outstandingly well, with plants of over 50 years old. Apart from Malbec, there are other great varieties such as Cabernet Sauvignon, Merlot, Syrah, Chardonnay, Sauvignon Blanc and Semillón. The second valley is the North of Cuyo Region. The best developed varieties here are Syrah and Bonarda. The third of the valleys is in the Eastern region. This traditional valley is the largest wine producer of the Cuyo Region, located at 33° 2’ South latitude. It is a plain which is fed by the waters of Tunuyán River. A vast region in which there are a great number of grape varieties that stand out for the intense fruity notes of their wines. Then the Uco Valley, made up of the front of the Andes Range and the Huayquerias region. It is the zone of influence of the Tunuyán and Tupungato rivers and the altitude ranges from 900 to 1,600 meters above sea level. Warm days with wide temperature ranges favor a slow ripening grape, obtaining wines with great concentration, suitable for long aging. In relation to the Uco Valley, white grapes such as Chardonnay, Sauvignon Blanc, Viognier, and recently Torrontés stand out for their freshness and terrific natural acidity, displaying intense aromas of citrus fruits, in some cases with spicy and mineral profiles, and in others, presenting floral and tropical characteristics. They are very complex examples if they are aged, and they usually offer excellent potential to age in the bottle for a few years, especially Chardonnay from the highest sub regions such as Gualtallary in Tupungato, Vista Flores in Tunuyán, and Altamira in San Carlos. The main red wines are Malbec, Cabernet Franc, Merlot, and Syrah. These exponents flaunt very deep colors, aromas of black fruits, spice, minerals, and flowers. Finally, the Southern Valley of Mendoza, which is a region with mid-to-low vigour vineyards that gives birth to balanced and elegant wines. The climate is hot, presenting cold nights and moderate drought. The main varieties used to make reds are Bonarda, Cabernet Sauvignon, Syrah, and Malbec; and for whites: Chenin and Chardonnay. Finally, Daniel Pi expressed that Mendoza has a great diversity of grape varieties and has larger areas of land suitable for cultivation, as its oases enjoy a greater availability of water suitable for agricultural use, thanks to the Mendoza, Tunuyán, Atuel, and Diamante Rivers. 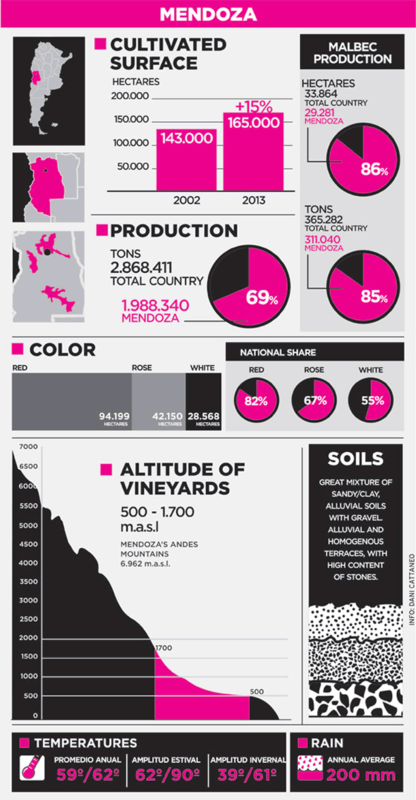 For this reason, Mendoza has over two thirds of the overall surface of the country cultivated with vines.